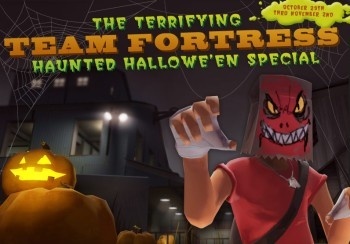 Halloween is just around the corner and that can only mean one thing: It's time for the first-ever Terrifying Team Fortress 2 Haunted Halloween Special! Halloween is the best holiday ever! Dressing up, running around the neighborhood with your friends, eating junk food until your ears bleed, worshiping the Devil - how could it possibly be better? Here's how: With the addition of the Team Fortress 2 Haunted Halloween Special, a super-spooky pagan update to the game that adds festively frightening new Achievements, hats and more! The Halloween update will feature five new Achievements like "Costume Contest" and "Attack o' Lantern," which will unlock the Mildly Disturbing Halloween Hats, "moldering, eldritch veils of such manifold depravity, the human eye will not process the sheer enormity of their malevolence." A new King of the Hill map called "Harvest" is also included, but this isn't just a normal map: This one is haunted by the ghost of Zephiniah Mann, a restless, malevolent spirit who will render all he meets paralyzed with fear! What else is there? Exploding pumpkins! And candy! The Ghastly Gibus! It's like all the awesomeness of real Halloween, without the aggravation of your lame-o parents telling you not to eat all that crap at once or you'll make yourself sick. That kind of freedom doesn't come along every day, you know. So go stuff your face at teamfortress.com!